Discussion in 'General Chatter & Off Topic' started by xcaliber, Nov 26, 2018. Well, as many know my health has been on the decline lately but I'm not dead yet! I cannot hunt per doctor's orders, and of course the Queen was there when he told me this, so now i have all three ladies on my tail. 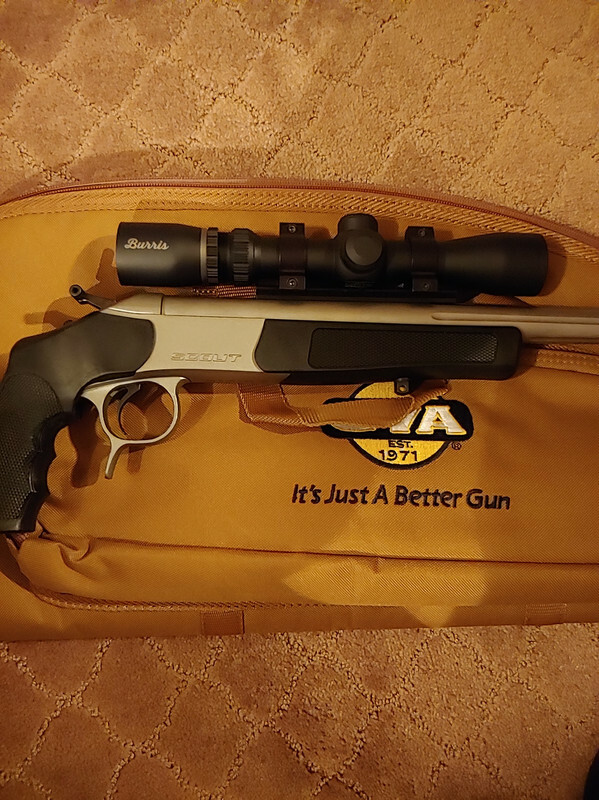 Anyway, I picked up another CVA handgun for deer hunting in the hopes that maybe I'll get out soon, but like the Cubs fans say "there's always next year". I'm pretty happy with all the hunting guns I have now, and don't think I'll ever get another one for hunting since I'm set for anything with the .308 Savage leading the power pack if I ever go for elk, or anything that large at longer ranges. That said, this is my new favorite hunting gun because of the weight, and easy carrying, but the accuracy won me over. Here are the pics of targets final sighting in @ 100 yards Saturday. The bullets, etc. My eldest daughter starting chewing on the Queen for letting me go, and she told her "you come watch him" he ain't dead yet! My love! 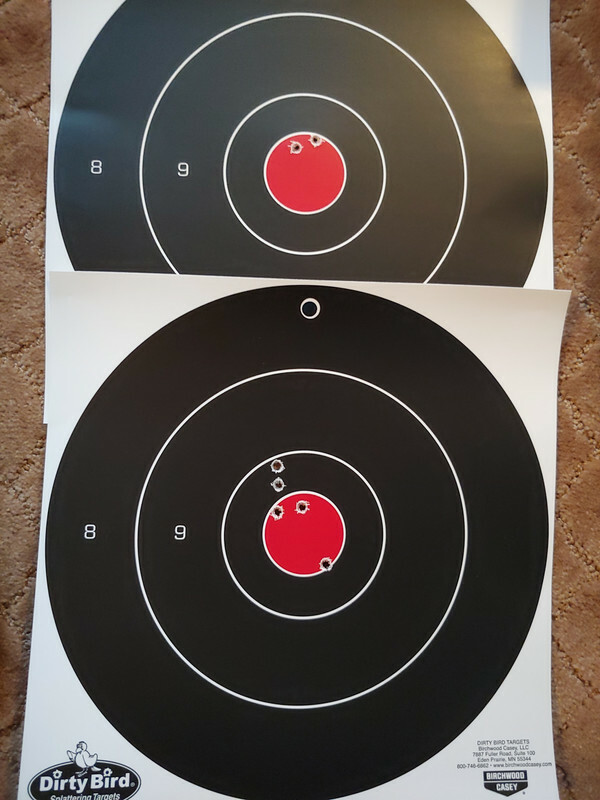 The top target pic is one bullet each, 100 grain & 95 grain. 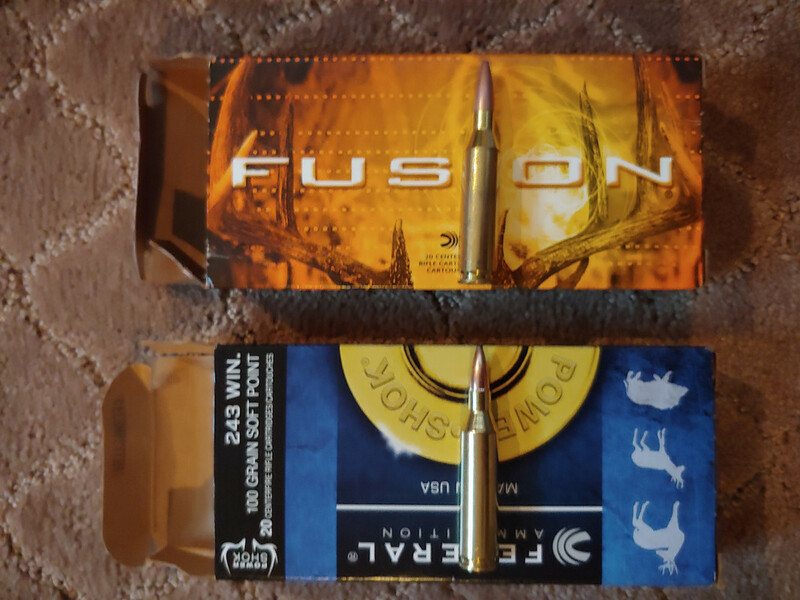 I went with the .243 Win caliber after much research with this caliber on deer & bear, originally was going to go with .308 but thought that would be too much in a handgun, I think I made the right choice. Oh, it is a two handed gun no doubt! The other is my .50 cal. Muzzle Loader on top of the .243 sweet pair for sure! Patriot, bbahunter and jacol84 like this. Wow. .243 handgun. Guess you got a good set of ear protectors. Very nice! Appears you have her dialed in! Nice job! I hope you get out Dan! Keep positive! Thanks, good news from doctor today, we'll see! Change in meds. AGAIN, but we're going in the right direction. Decided to upgrade the scope on the .243 handgun. 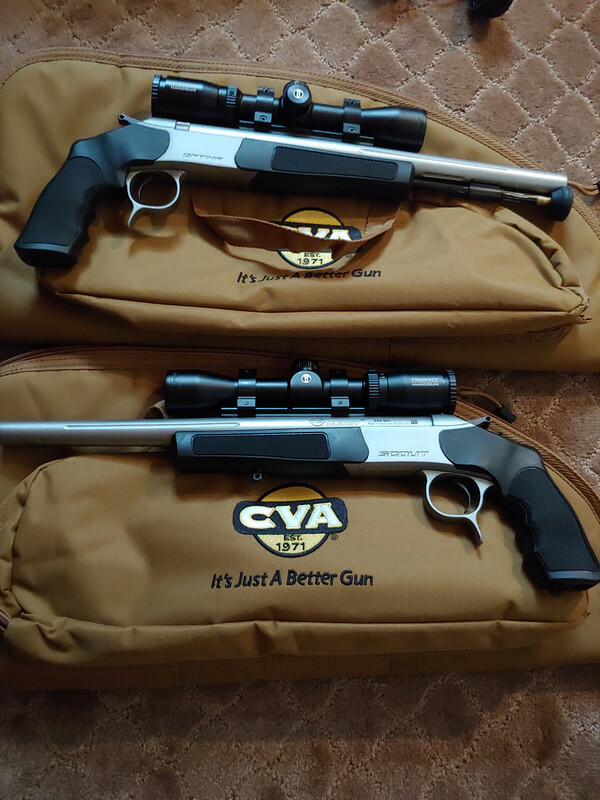 My buddy is thinking getting the muzzleloader from CVA & said he would take the Bushnell off my hands for a square price. I think this gun could be a 200 yard gun and think the better glass was worth it. I'm going to sight it in Monday evening at our indoor range about 8 miles from here. They have 25 yards heated! Bore sighted her after installation, don't think I'll sleep much now! 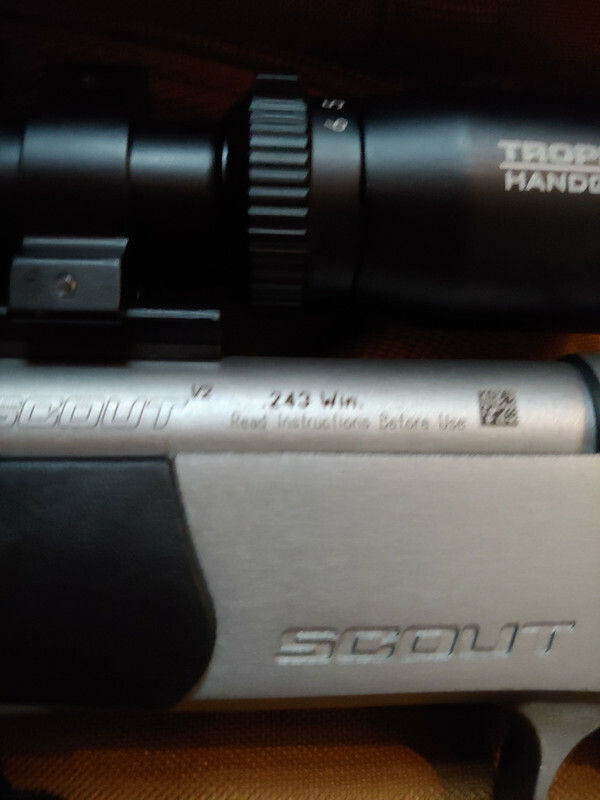 I have been hawking this scope for a while, and never find them under $300, got it new in the box for $250. ChaChing! That's a sweet set up for sure, your making me drool big time. That's a lot of snot for a handgun . The .243/6mm is a very popular deer caliber around here, both of my kids have 243's. Like the man said "
. They are devastating on deer size critters. I've skinned a few deer hit with them and the shock power is impressive, don't hit a shoulder bone with it . I have always been a double lung shooter, if I hit the heart, I missed! A lot of gun hunters clain that the best shot to put a deer down right in it's tracks is just above the shoulder, I'm not convinced yet. I don't mind tracking a good blood trail personally. Since my treestand hunting days might be over, I'm working on my ground game! This includes a good field rest for rifles & handguns. I have been working on this for a while actually for use at the range, checking guns in the field, etc. I'll get some pics. & details posted in the next few days. ince my treestand hunting days might be over, I'm working on my ground game! Yepper, I'm a ground hunter now days, It's not a bad thing at all. Heck, just seems like anywhere I hit them with the old 25-06 they hit the ground ground hunting is becoming my new thing also ,much more comfortable for me than sitting in a tree stand. When I was young and rifle hunting I used to always shoot deer high in the shoulder and DRT. But as I got a little older I started realizing I was wasting a lot of meat as both front shoulders were usually totally blood shot and not usable so I started doing DL shots instead. They do run a ways when DL shot with a rifle or bow but I need exercise anyway. Yes sir, I've tagged several with my 25-06, they drop like they were hit with lighting most of the time. On paper the 25-06 & .243 are almost identical ballistics wise, but the 25 with 120 gn bullets will out preform the 243 for knock down power every time. xcaliber, jacol84 and Oppie like this. Yes sir . Mine needs to lose a couple of pounds then I'd carry more. Instead I've been carrying the big brother, my 30-06 or the bolt action 30-30 when I can pry it away from my wife's hands.